This was one of the most exciting, if surreal briefs we’ve ever had. First, a fake laboratory was created – all dry ice, ultra violet lights, vials and potions. Mad scientists in biohazard suits served ghoulish ‘Blue Sky’ cocktails in lab flasks (a heady combo of gin, lemon juice, blue curacao, sugar syrup, prosecco and Earl Grey smoke). Jo Moody and her team scoured the internet for chemistry props: petri dishes, syringes, mini pipettes – all ingeniously presented with canapés. Little short rib bon-bons sat in miniature petri dishes of horseradish. 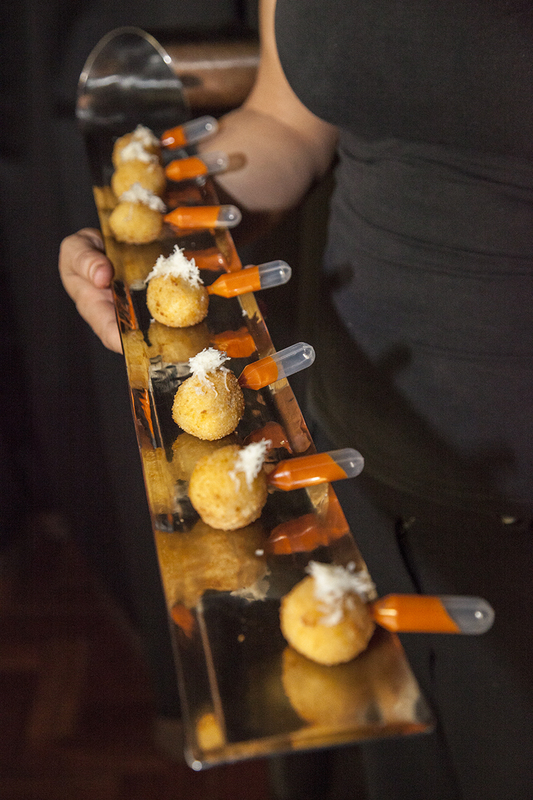 Arancini balls came with mini pipettes filled with red pepper velouté. Individual syringes of gin and elderflower, or rum and raspberry were lined up to ‘pimp your prosecco’. You get the vibe.